Former Lewiston High School standouts Cole Ouellette and Jeromey Rancourt have standout performances. TYNGSBOROUTH, Mass. — The L/A Nordiques bounced back from a Friday’s loss to the New England Stars by earning a 5-1 win over the Stars on the road Saturday night. Cole Ouellette opened the scoring for the Nordiques just under nine minutes into the game, and that was followed by Joshua Sanchez’s goal 33 seconds later. In the second period, Zachary Cormier scored New England’s only goal off an assist from Eric Glover 3:27 into the period. Valeri Rykov scored for L/A seven minutes a few minutes later, and Sanchez’s second goal of the game with three minutes left in the second. Rykov scored his second goal of the game 2:23 into the third period to finish off the win. Andrew Ghimpeteanu saved 31 of New England’s 32 shots, while Matthew Marini made 33 saves for the Stars. AUBURN — Guillaume Bose scored the game-winning goal in overtime as the Northern Cyclones dispatched the Twin City Thunder 4-3 in USPHL junior hockey action Saturday evening. 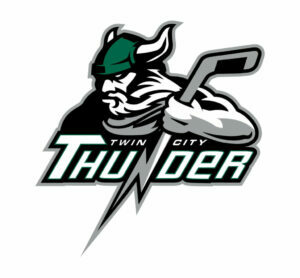 Jeromey Rancourt scored the opening goal at the 10-minute mark of the first period and then tied the game at 2-2 with less than three minutes remaining in the second period for the Thunder, who were playing their final home game of the season. Following an Alex Laplante goal in the fifteenth minute of the third period for the Cyclones, Derric Trudeau responded with a goal off an assist from Rancourt and Etienne Crousle at 17:57 to force overtime.